The next time your unable to take home your equipment to wash it, try vodka for a quick deodorizer. Spritz garments with a small amount of vodka (spot-test first). 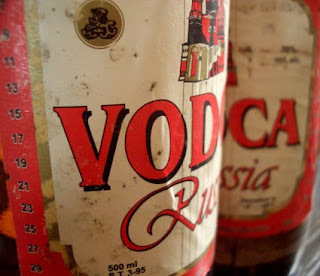 Straight vodka kills bacteria, but it doesn’t leave a scent. Hang clothes to dry in a well-ventilated area. Throwing your stuff in the washing machine is probably still your best bet, but this little trick might come in handy. Some gear (my shinguards, for example) use removable Velcro inserts that can be easily removed for washing. Not all equipment has this feature so you might check the tag first to make sure. You can bet this was the preferred method of hockey great Sergei Fedorov! This entry was posted on on January 14, 2010 at on January 14, 2010 and is filed under diy, equipment. You can follow any responses to this entry through the RSS 2.0 feed. You can leave a response, or trackback from your own site.